A group of tractor fans will bring new meaning to the footballing cliche taking the foot off the gas when they play a game with a difference. 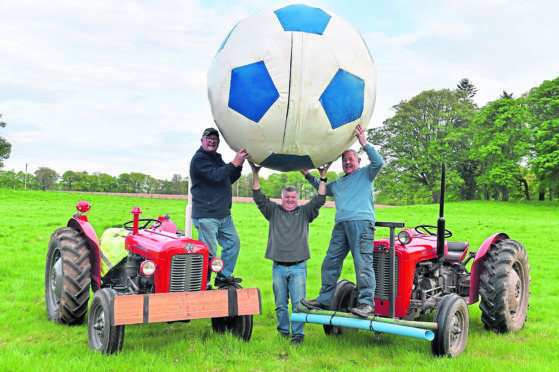 Members of Mearns Vintage Vehicle Club have organised a game of tractor football with their historic models at the Fettercairn Show next month. The game is played with three vehicles on each side which all have wooden boards attached to the front. The four teams competing are made up of orange Nuffields, blue Fords, red Fergusons and grey Massey-Fergusons, which have an age range of 50-70 years. Each vehicle is only permitted one touch and unusually there are no goalkeepers participating. The game will be split into halves of 15 minutes and linesmen will ensure the ball, which is about 6ft in diameter, does not go far from the field. David Birse, former Brechin City FC chairman, will provide commentary from an elevated platform alongside a referee who will use a horn to stop and start the game. Mike Robertson, chairman of the vehicle club, said: “It’s been done with modern tractors before so we thought it would be a good idea to try it with vintage models. “We wanted to do something different for this year’s show and we have all of these tractors to show off. “It will be easy to differentiate between the teams because they are all different colours, some of them are so small you can barely see the top of the ball. The Fettercairn Show takes place on July 7 at the Bridgend Show Ground. Gates open at 9am.